- Kindly place non-customized orders at least 7 days before the claiming date. - Kindly place bulk orders/customized orders at least three weeks before the claiming date. - Rush orders may be accepted depending on Niji Desserts' availability. - Finalizing your order through settling the 50% non-refundable deposit confirms that you have thoroughly read the Terms & Conditions. Failure to read the Terms & Conditions will not exempt you from it. email/mobile message will be sent to confirm your interest in ordering for a particular date. Failure to reply to the follow up message after 24 hours will be interpreted as a cancellation of your reservation. - A minimum of a 50% non-refundable down payment via bank deposit upon an agreed date is required to confirm your order Balance of payment must be completely settled on/before the pick-up/delivery of your order otherwise your order will be forfeited. - A follow up email/mobile message will be sent to you 3 days before payments are due. Failure to settle payments on the agreed date will be interpreted as a cancellation of your order. - Any desired changes to custom designs for orders must be requested 10 days before pick-up/delivery of your order at the latest. Changes requested beyond the required time period will no longer be entertained. - Upon pick-up/delivery, you/your representative will be given the opportunity to inspect your order. A waiver may be presented to you/your representative to ensure that your order was received or set-up in good condition. Niji Desserts will not be liable to damages on the product after it is received/set-up. - All of Niji Desserts' products are best kept in a cool environment at all times. An area with air-conditioning is best. - Fondant/gumpaste/pastillage figures and tiered cakes are supported by toothpicks/straws/dowels. Please be sure to remove these before cakes/cupcakes are served. - During transit, it is best to keep products on a flat & stable surface/the floor of your vehicle ideally with a non-slip mat. - The Product Care section serves as a guide for prolonged storage of your product. Nonetheless, conditions may vary in different environments and this guide must thus be followed with care. 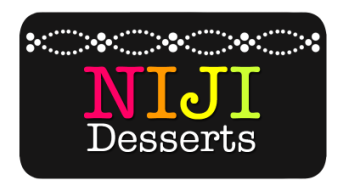 Niji Desserts highly recommends that your order be consumed the day you receive it. Be vigilant and exercise good judgement in storing and consuming products. - In cases of a fortuitous event on the side of Niji Desserts, natural disasters & all other unsafe conditions which will cause a failure to complete/deliver your order or cause a cancellation of the event the order was made for, an agreement for a refund can be made. - Niji Desserts reserves the right to not be held liable for damages caused by such fortuitous events. Niji Desserts will however always do whatever it takes to ensure that you receive the high quality of products and service you deserve. - All images, photos, cake designs posted on this website are property of Niji Desserts/Clarissa Banaag unless otherwise specified. Please do not use, copy, repost images, photos and cake designs without permission from Clarissa Banaag/due credit.